FREE TASTER SAMPLE containing the first two sections (p.1 - p.52) of the OCR B Specification. These condensed revision notes (flashcards) are designed to facilitate memorization. They have been created by a very experienced Chemistry tutor. They contain all the necessary exam knowledge in a short, easy to memorize form. Each page covers the key facts, such as definitions or equations, of a single topic, without the distraction of unnecessary information. Knowing them by heart makes it easy to achieve top grades. Tried, tested and proven by past tuition students they are an effective and successful way to prepare for exams. 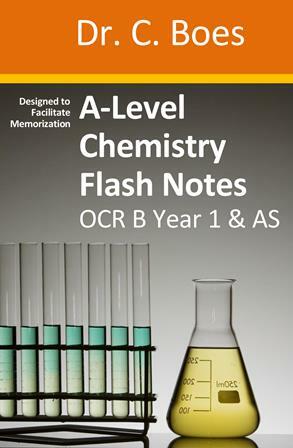 They have been adapted to the currrent OCR B Chemistry A-level Year 1 & AS syllabus (from Sept 2015). This book is organized in chapters according to the syllabus, which allows natural progression in sync with your school work. Created with great care, it includes important information specific to exam questions. This eBook is much more convenient than bulky, messy paper notes. Carry it with you on your smartphone, tablet or laptop wherever you go. Memorize on the bus or while you wait. Find topics in an instant with the search function. Try it now!